Ó Cíobháin suggests that this name may be a corruption of Doire na Féinne, a nearby townland. It is otherwise difficult to explain. Knocknabrone Hill is the 1049th highest place in Ireland. 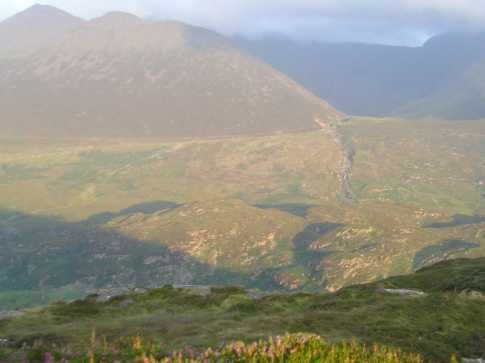 Picture from group : Knocknabrone from the South. 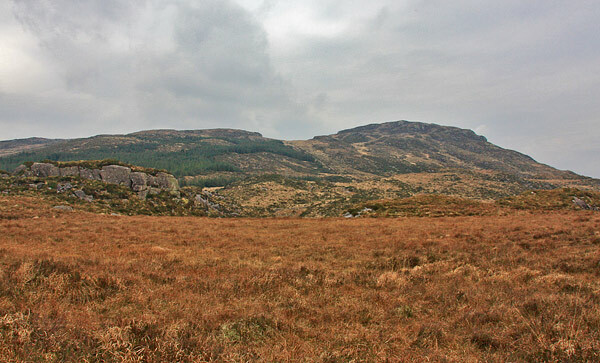 Picture: Knocknabrone from the South. Rough ground, great views, shortish walk. This is a hill isolated by roads and properties and makes for a short though somewhat rough up and down walk. Walking in a dry period would be preferable though not essential. There is a spot height of 228 on a rocky bump and either side is equally good or bad. Generally, follow the east edge of the forestry plantations, using the numerous sheep tracks as there is no walking path through the occasionally dense furze. 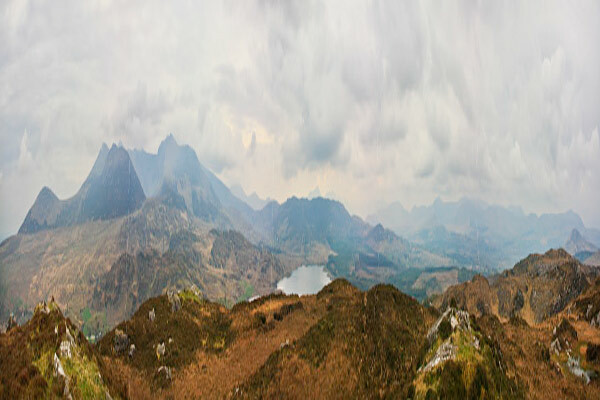 The top is around 1200m away which will take aournd 40 mins to reach and about 30 to return. Note that the apparent minor road on the OS map leading north from L. Acoose is in reality a forest track festooned with an Ireland of the Unwelcomes sign. It's hard to do justice with the extent of the view in any photograph, particularly from a dull day, of the enormous 220 degree panorama that Knocknabrone enjoys, but we can at least have some fun with it.